Mediocre Musician: Budget instruments?--Yes please! Nowadays, however, manufacturing processes have come so far that companies are making very high-quality instruments at budget prices. For people like me (a casual player who likes to dabble in a little of everything), this is pure awesomeness! But, if you're someone who's been looking to pick up, say, the guitar or ukulele, it's never been a better time! There are tons of great-sounding, high-quality, playable options out there at really low price points. It's more than just affordability! I'm a firm believer that for a beginner to become good (with guitar for example), their guitar should be out, and accessible. 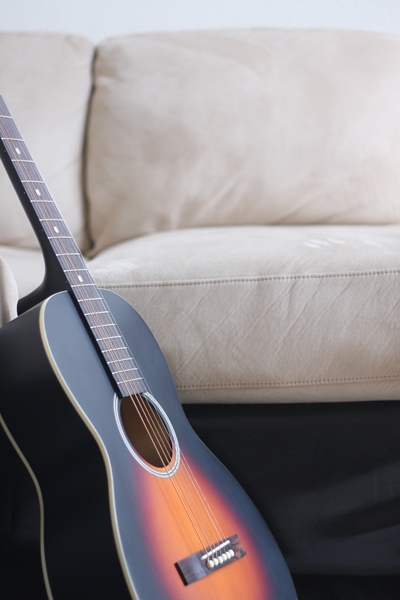 (So while it might feel more "pro" to have a fancy guitar that you keep in a humidity-controlled case, you'll be a lot better off with one you can keep on a stand within arm's reach of your desk or next to the couch to play during commercials.) --Simply put, the more time the instrument is in your hands, the better you will become. I also feel much more constrained to play "delicately" with an expensive guitar (worrying that I might scratch the finish or get too much palm-sweat on the neck). Part of learning is experimenting, and cheaper guitars give you the freedom to put it through the paces--get into a heavy jam, or start bending those strings! Along the same lines, it's travel friendly--there's less worry about taking a cheaper guitar with you on a camping trip or to a friend's house for a jam session. Lastly, there's just a lot less pressure to be good. It's much more impressive to be the guy who can belt out a few tunes on a cheap guitar, than the poser guy who walks into a room with some pricey guitar he can barely play. With budget guitars in particular, it also gives you the opportunity to own more than one. Admittedly, I've been on a guitar-buying kick lately. (Something I wouldn't be able to do with thousand-dollar guitars.) Check out my other post for details on my bang-for-the-buck guitar collection. Quality should be first and foremost--especially for a beginner. (Nothing will slow you down more than an instrument that's working against you.) RESEARCH research research. 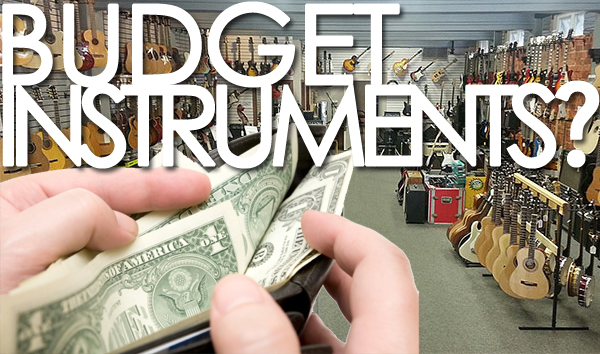 Are all "cheap" instruments good?--Of course not. But you don't have a to be a brand-snob either.